London Mayor Boris Johnson has suggested that owners of diesel vehicles could be persuaded to scrap them by a payment of £1,000 under a national scrappage scheme. A national scrappage scheme was introduced in 2009 to encourage owners of vehicles older than 10 years by paying £1,000 towards the cost of a new car. The scheme was primarily intended to boost new car sales rather than being environment-improving and ended in March 2010. 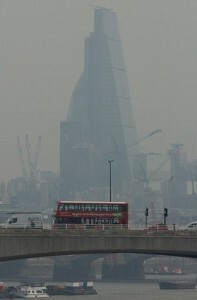 “Contrary to any misleading claims, London’s levels of air pollution are lower than many world cities. We know this because we are serious about monitoring pollution levels." The Mayor and his environmental and energy advisor Matthew Pencharz will give evidence to the Environmental Audit Committee from 2.15pm on 10 September. Photo by Ian Wylie in the Londonist Flickr pool.